A while back, I pitched a small web story that grew into a multi-page feature profiling the people behind some of Hawai’i’s podcasts. Many thanks to the editors of HONOLULU Magazine for expanding my focus, as well as co-writer James Charisma and photographer Aaron Yoshino, for ushering this story into print. I was especially happy to shine a light on fellow writers Anjoli and Jocelyn of It’s Lit, who have since left KTUH but keep their show streaming online. You can read the entire feature in the February 2019 issue of HONOLULU Magazine. In the summer of 2018, my partner Spencer and I inherited the reins of Mixing Innovative Arts (MIA) Honolulu, a monthly reading and literary arts series. This was my first reading at MIA as a co-organizer. The theme of the event was around politics, and I read a satirical piece I had recently published in Honolulu Civil Beat. It was a fun night with more laughter than heated discussion, and I was delighted to share the stage with fellow Hawai’i writer/politician Sonny Ganaden and Hawai’i poet D. Keali’i MacKenzie. I'm happy to announce that my Sasquatch poem, originally published in Waccamaw: A Journal of Contemporary Literature, found a printed home in the new Ms. Aligned 2: Women Writing About Men. 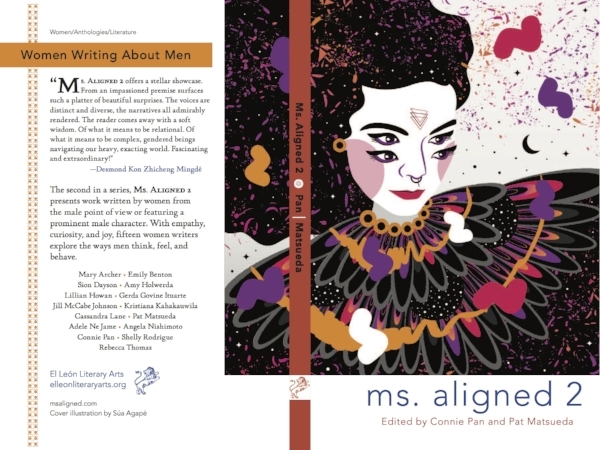 This beautiful anthology of women's poetry, fiction, and nonfiction was edited by Pat Matsueda and Connie Pan and includes a lovely introduction by Kristiana Kahakauwila. For the month of November, you may enter the Goodreads contest to win a free copy. Also available for purchase via Amazon or msaligned.com. Read more about the contributors here.